This weekend I cooked three things – two of which are favorites of various family members. This recipe is for borscht, which is an Eastern-European cold beet soup. It might not sound great, and if you have ever eaten the Manishewitz kind you may be turned off, but trust me, this version is delicious, nutritious, and really colorful. My Grandpa Julie loves borscht, even the one from the jar, so when I made him this the first time, he, and my Grandma Gloria, loved it. My next post, coming later this week, will be Brock’s favorite turkey parm meatballs. 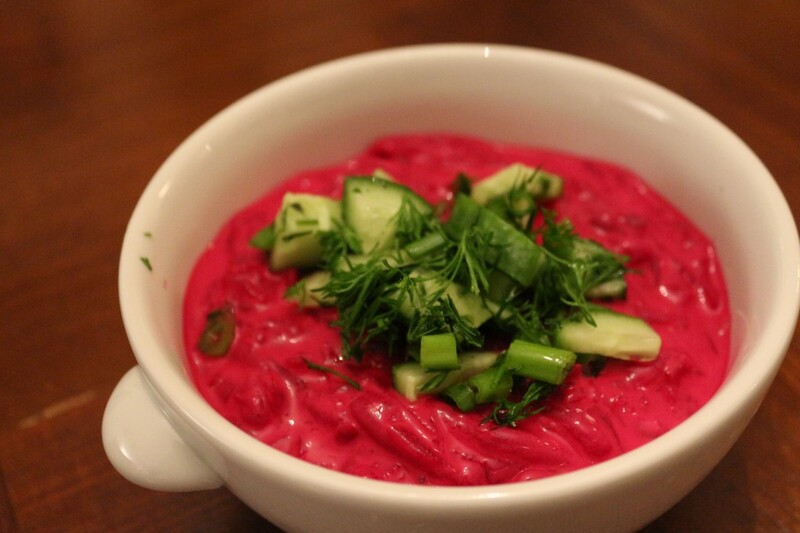 But for today, let’s go for the pink and delicious borscht. 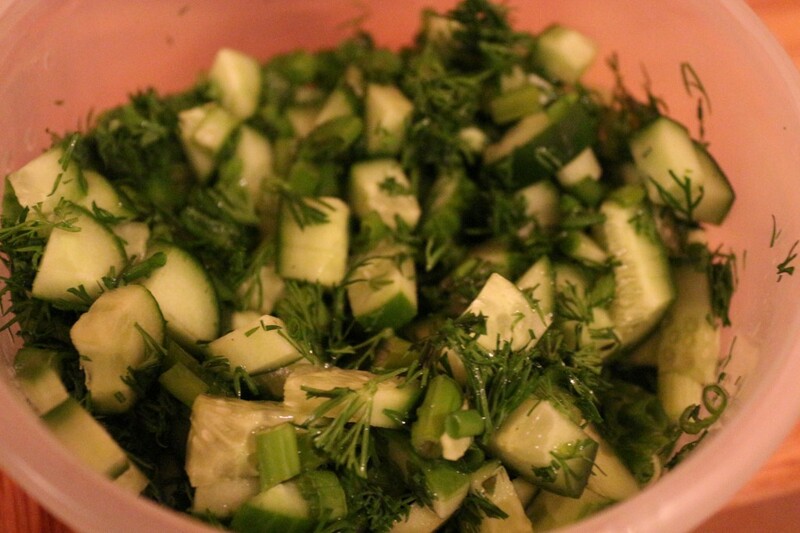 Adapted from an LA Times recipe adapted from Warszawa, a Polish restaurant in Santa Monica. 1. Trim the roots and stems off the beets. Place the beets in a pot with enough water to cover them about 1 inch. Bring to a boil and cook for about 45 minutes until the beets are tender. Remove and allow to cool. 2. Once the beets are cool enough to handle, gently peel off the skin with your hands (it will come off easily). Grate the beets into a large bowl. Mix in the buttermilk, sour cream, sugar and lemon juice. Add salt and pepper to taste. 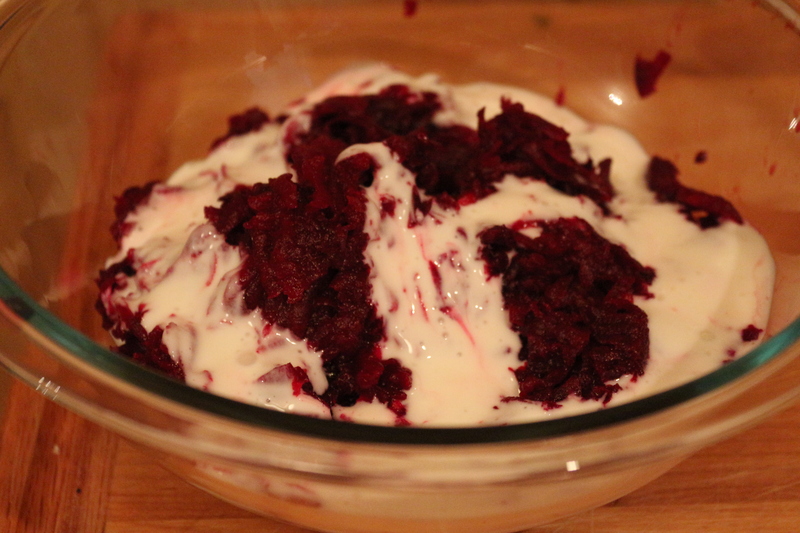 This entry was posted in Mains, Sides, Soups, Starters and tagged beets, Gluten Free, Jewish Foods, Vegetarian. Bookmark the permalink.